This painting is a donation to Winefest 22, an event to benefit children's health research, education, and care at University of Minnesota Masonic Children's Hospital. If you are interested in bidding on this painting or would like more information about Winefest 22 Click Here. I wanted to create something that reminds me of the different moments in which I like to enjoy wine. We often drink wine in times of celebration, but I also love a good glass in those tender, intimate moments. So, I wanted to make something that is both vibrant and tranquil. 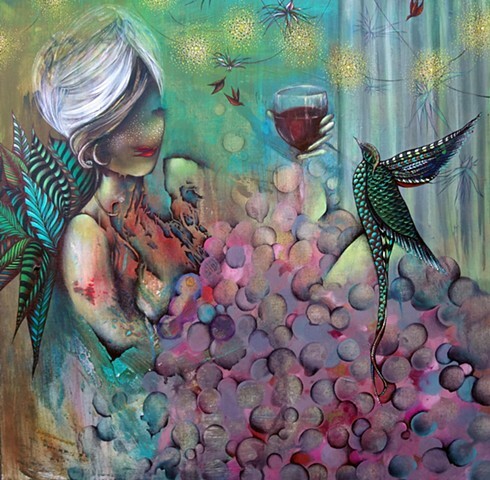 At first glance you see vibrant colors, bubbles and birds, the sweet moments. The longer you look, you'll notice more complex moments with hints of darkness. It happened to be that my grandma passed away while I was working on this painting, so I was thinking about her a lot during this process. It occurred to me how fitting it was that I was working on this donation to children's health while thinking of a woman who dedicated her life to children's happiness. In fact, her last words to my brother were, "take care of the kiddos." So, in honor of my Grandma Grace, I titled this piece "State of Grace."